Apple has been very strict on allowing apps into the AppStore that compete with the apps that they ship with the iPhone. Over the years they've relaxed some of their rules (allowing browsers like Opera for example into the AppStore), but mail apps haven't been approved. Until recently. 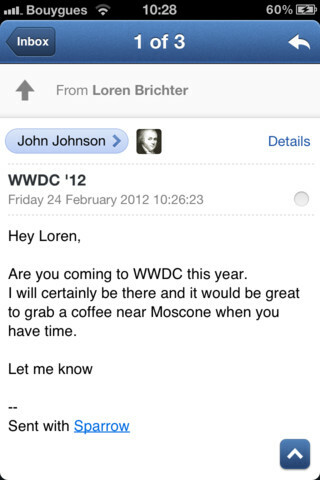 The most anticipated mail app to be approved in the AppStore is Sparrow. Sparrow has been a Mac email client for about a year and has received a ton of great coverage. A lot of people really love it and use it as their main desktop email client, instead of the built in Mac Mail application. Now, finally, Apple has approved the Sparrow version for iPhone, and it's great. Sparrow is focused around simple and beautiful design. They want to offer a pleasurable yet more efficient way to deal with your mail on your iPhone. And they do. Aside from the great looking design, the app is focused on the most common actions while still giving you easy access to advanced functionality you may need. 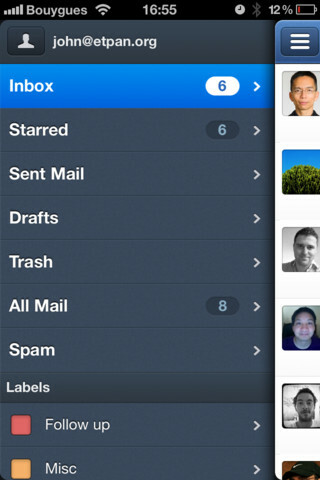 In Sparrow everything is a swipe away, swipe once to uncover your mailboxes, labels and folders. Swipe again to get to your account list. 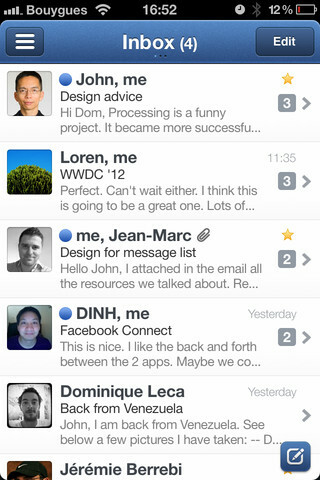 Or swipe up or down on a message to navigate a conversation. Directly attach photos & images when composing a mail. No more cumbersome back and forth with your photo library. Smart contacts - your most frequent contacts on top of the list. 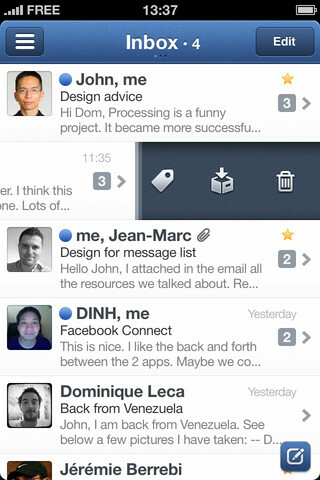 Sparrow for iPhone supports IMAP (so Gmail, Google Apps, Yahoo, and iCloud work). There's no POP mail or Exchange support yet. Also, there are no push notifications yet (Apple hasn't approved the Sparrow version that has push) but personally I don't mind. I'm a BIG fan of push notifications, as people around me know, but prefer using IM+ for push notifications about new emails. Whenever I get a notification from IM+ about and email that I want to read I launch my mail app. Or you can use Boxcar for push notifications, also works great (and free). Sparrow for iPhone is a great deal at only $2.99 (I bought the Mac version for $10).